An ordinary day becomes one of terror, as every single child in the world stops. A message is sent to all the governments of Earth: "We are coming." But, as a trap closes around Captain Jack, the sins of the past are returning and long-forgotten events from 1965 threaten to reveal an awful truth. 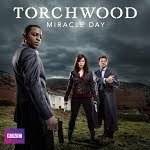 Torchwood is forced underground as the government takes swift and brutal action. As members of the team are hunted down, Britain risks becoming a rogue state.